One of the highlights from our trip to Maui was a heli-tour over West Maui and Molokai with Blue Hawaiian Helicopters. The last time I was in a helicopter was back in 2009, when we landed on the snow-capped Remarkables Mountain range in Queenstown, New Zealand. Floating over the earth in a helicopter is a thrilling experience, one that everyone should try at least once in their lives. We spotted a small rainbow under the clouds! Arrival at Kahului heli-port – mission accomplished! 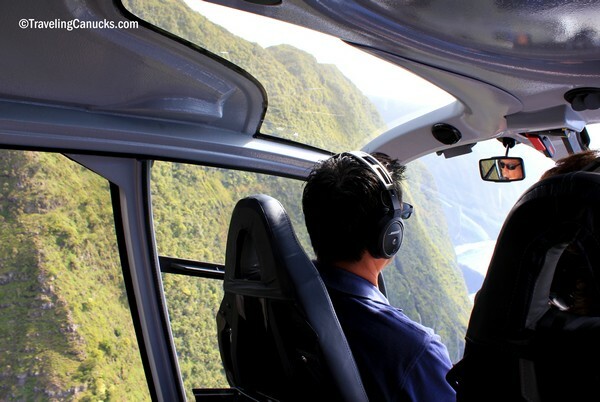 Thinking about taking a helicopter tour in Maui? Check out Blue Hawaiian Helicopters and tell them the Traveling Canucks sent you. 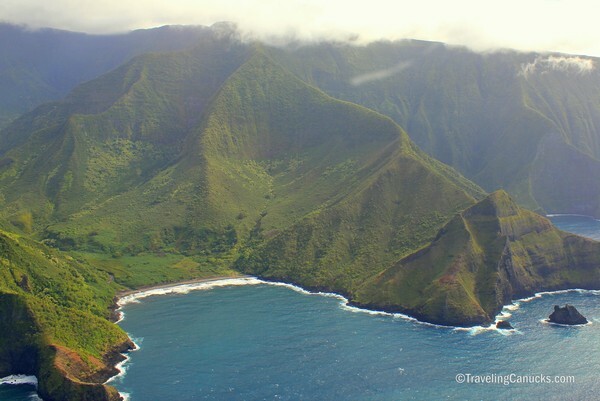 Disclosure: Big thank you to the Maui Visitors & Convention Bureau and the good people at Blue Hawaiian Helicopters for the complimentary tour of West Maui and Molokai. I can’t think of a better way to experience the Hawaiian Islands! Oh I LOOOOVE the rainbow photo! This looks like it would be incredible. My friend is a pilot and he took me up for a ride for Christmas! It was incredible whizzing by the mountains in Thunder Bay, Canada! But Hawaii – WHOAAA. Yes, we got lucky flying right through a rainbow! Although we were later told that this is quite common, but it was still pretty cool. I’ll bet it was quite pretty flying over Ontario during the winter! Ah- so exciting! We are heading to Maui in December and we are making sure this is on our itinerary! Great shots, guys! This is awesome. A helicopter ride is on my bucket list. They do them in Istanbul. Just have to pluck up the courage! Wow! This is beautiful. I went on a helicopter tour of Kauai many years ago, but it’s been a long time, and I’d love to go again, this time with a camera! I’ve always wanted to take a helicopter ride, but Kali is scared of heights. Hawaii seems like a great place to take the plunge, though – I’d love to fly over some volcanoes! I’m not a big fan of heights either, and Nicole doesn’t like to fly, so I know where you’re coming from. That said, being in a helicopter is surprisingly not as scary as I initially thought. Some of those photos are just full of color! Awesome! 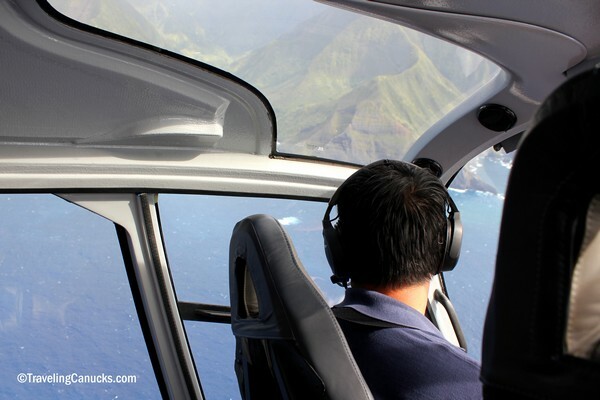 Ever since doing a helicopter ride on Kauai, we’re hooked! It’s a lot of fun! And the views are outstanding! Gorgeous! I’m really hoping to do this when we head to Maui. Not a bad way to see Hawaii. Gorgeous. Some of those colors, wow. I love helicopter rides! These are such awesome shots! One thing I would LOVE to try! Have yet to go up in a helicopter. Great photos! Thanks Debbie! It was a lot of fun. Hopefully you’ll get a chance on your next trip! The photos are so beautiful. The views above the helicopter are so stunning. Seeing the place is fantastic. 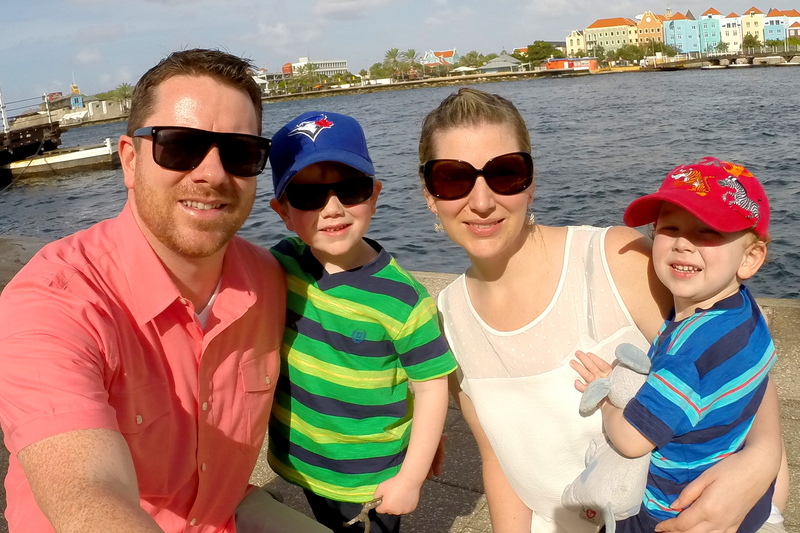 Thanks for stopping by Pauline – we’re happy you like the photos! Wow how stunning. From what I’ve seen a helicopter flight is so the best way to see Hawaii, and so Magnum PI! This is awesome. Last August I experienced a helicopter ride at the maasai mara in kenya. Watching wild beast crossing river from birds eye view was one of the best feelings I have ever had.